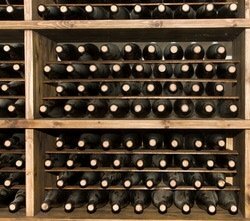 Wine Storing becomes an issue when you end up buying wine faster than you can drink it, or when you become a collector. If you plan to keep wine for a long time, you should protect it, particularly if you live in an area where temperatures are extreme (wine seems to think that anything above 70ºF or 21ºC is extreme!). Your garage is not a good place, nor is your broom closet, and forget the garden shed. Perhaps you are among the lucky few who own a home, perhaps a castle in Spain, with a cool dark cellar. Congratulations! But if you are like the rest of us, you need to find a wine storing place in your home, where you can create a good environment for your precious bottles. You want a place where the temperature doesn't vary too much. You also want a fairly high level of humidity, and you want a dark place, because sunlight will damage wine. Make sure that there are no chemicals, paints, garden supplies that can harm the wine. You may want to buy wooden wine racks, or you may be able to construct them yourself. There are wine rack plans available on the internet, and you can also find them on magazines. Metal racks are also excellent. There are also wine refrigerators, but they are not very practical for a fairly large collection of bottles. If all else fails, you can store your wine in a rented storage space that is refrigerated, but this is quite inconvenient, as you cannot decide to drink a bottle of wine on the spur of the moment, nor is it easy to catalogue your collection. There may also be a cost issue. A wine cave, or wine vault is another option. These are fairly large refrigerated units that are attractive and practical. They can cost a little as a few hundred dollars to thousands, depending on the size. If you decide to go this route, and you can afford it, don't skimp on the size. You will want to have a unit that allows your collection to grow.